The short story is that Audrey Zibelman who heads up AEMO wants to keep the lights at cheapest cost, and sees paying consumers to reduce demand (‘demand response’) as a legitimate way of meeting peak demand. John Pierce who chairs AEMC (Australian Energy Market Commission) believes that the market should not be interfered with unless there is an actual emergency, and then only as a last resort on a short-term basis. They are worried about the long-term use of demand response distorting the market, reducing incentives for investments in capacity. You can tell by the photos I’ve chosen who I think is on the right track. 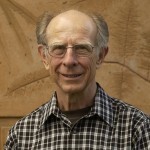 Pierce believes that to build a ‘strategic reserve’ of electricity capacity to be used only in emergency will be very expensive, raising electricity bills. Zibelman believes that if you exploit ‘demand response’ to its fullest, and have regular and repeatable protocols in place, you won’t need a strategic reserve. Price spikes will be avoided and electricity will be cheaper. Problem is, if Zibelman wants to do what she has in mind she can’t go past the rule-maker. She has asked for a nine-month window for RERT and as linked above, the AEMC will soon make a ruling so that action could take place from June. To back up a bit, the responsibility for finding electricity for consumers rests with the retailers, who conclude longer term contracts with generators to meet most supply. However, this is supplemented with the spot market, run by AEMO, who are responsible for balancing supply and demand, essentially in five-minute blocks. Although it was near midday, there was a lot of cloud around. So solar was way down. The wind was blowing well in SA and Victoria, not so in NSW. Qld does not have any wind yet. NSW was a bit of a sink hole as usual, and was effectively being topped up by gas in SA and QLD, plus increased coal in the three larger states. There is gas also in Victoria and NSW, which can come into play as demand increases. A full account of the past summer is available in the May AEMO report. 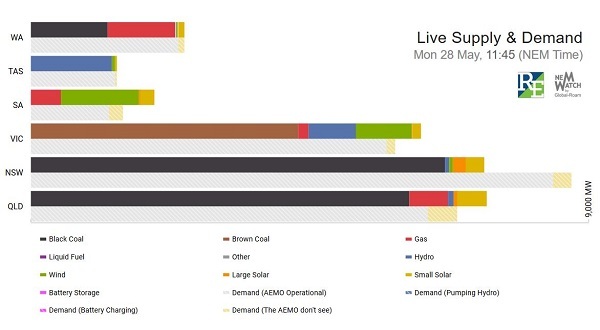 Gas generators were re-opened in SA, Qld and Tasmania, giving 833 MW of extra generation. 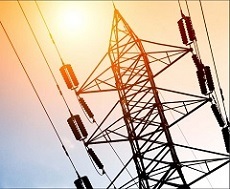 Diesel generators in SA and Victoria provided an extra 274 MW of temporary generation. To that was added 867 MW of RERT demand response. Clearly there was a learning curve in setting this up, which could be capitalised upon if the same companies were used again. During the summer, demand response was called into play twice, I understand, with the AEMO strategic reserve only costing $6 per household. It should be noted that Energex in SEQ has been using demand response since 2006. Capacity was increased to about 800 MW in 2017, with PeakSmart (cashback for turning down home aircon) being extended through Ergon to the regions. This would have increased Queensland’s reserve capacity quite apart from the AEMO strategic reserve. Queensland’s actions do not require NEM rules. I would be surprised if any rule or law changes were necessary. It seems to me that similarly demand response should form part of AEMO’s standing brief, to be implemented as a delegated function from COAG. Zibelman tried to develop a channel directly to COAG, bypassing the AEMC, but failed. AEMC is chaired by a lawyer, and when Chief Scientist Alan Finkel visited in the course of his review, asked “why are we here?” when he found no engineers present. We will soon see whether they are a speed bump on the road or an actual road block to progress. 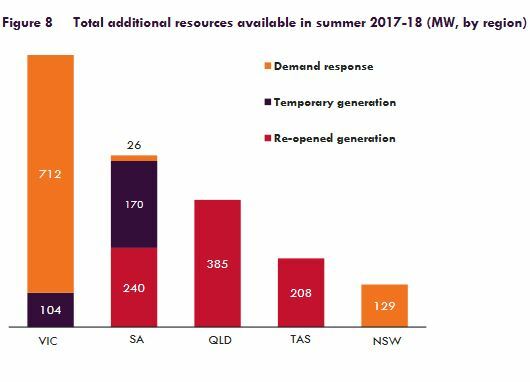 Queensland’s experience with demand response has apparently not had a negative effect on the $20 billion development stream of new renewable generation. However, some southern policy makers appear not be able to see anything north of the Tweed. a method used by CitiPower/Powercor to lower demand by 60 MW-100 MW for the RERT just by slightly lowering the voltage in substations could be used by every distributor in the National Electricity Market, which would sharply increase the amount of demand response capacity available. AEMO’s active concerns run from ensuring gas and coal supplies for generators, scheduling generator maintenance away from peak demand times, to network performance, grid stability, batteries, behind the metre developments and using machine learning to predict demand. Engagement and communication appears to have gone to another level since Zibelman was appointed. The role of big batteries was newsworthy, with the fossils in government completely missing the point. On Monday this week (28 May) an article appeared in the AFR on page 3 – Mike Cannon-Brookes blasts Tesla battery critics. Cannon-Brookes was the software billionaire who “accidentally” brokered the building of a big Tesla battery in South Australia after a Twitter bet with Elon Musk. It charges when the price of power is low, then discharges into the afternoon peak. While it makes $90.56 per megawatt hour on the differential it helps to keep spot prices down. Mr Cannon-Brookes said the battery had “far surpassed everybody’s expectations”, and that those who had dismissed its relevance had been proven wrong. Given its 100 megawatt output in a South Australian energy market whose peak demand is about 3000 megawatts, Treasurer Scott Morrison had compared the battery’s usefulness to Coffs Harbour’s Big Banana, while Resources Minister Matt Canavan had dismissed it as “the Kim Kardashian of energy”. Morrison is Treasurer of our fair land and Canavan Resources Minister. These are the people running our country. Next summer there will be three big batteries, with two more in Victoria. 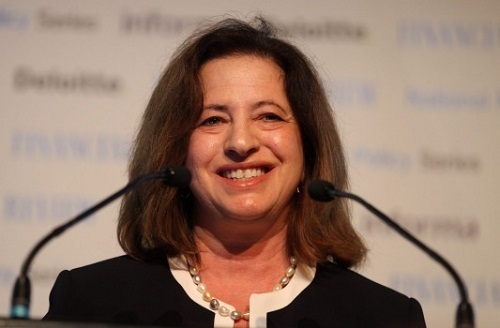 Meanwhile our prospects of making the National Electricity Market fit for purpose would be enhanced if COAG got behind Audrey Zibelman and John Pierce was put out to pasture. Interesting to see how the Tesla very big battery has performed over several months, both financially and in power demand terms. Australia’s incumbent generators, led by Snowy Hydro and the main lobby group, are fighting back, having seen the gas cartel’s earnings smashed by the presence of the Tesla big battery in South Australia and EnerNOC’s demand response activities. previously compared “demand response” to enforced blackouts, but his antipathy may be largely based on what it would do to his company’s revenues. Sounds like the financial case for Turnbull’s great big project now look very very shaky and we must wait and see whether Turnbull will try and game the system to reduce competition to his precious scheme or fess up and change his policy. Part of the problem is that the power system is being run as a marketing system instead of an operating system. Oh for the good old days when state governments owned the power system and the system was run by power system professionals who seem to have known what it is all about. First up, I’ve done an edit of the post. Not much has changed, except the AEMC chair is John Pierce, not John Price. Also the capital/establishment cost of demand response is not zero, so I’ve made it “approaching zero”. John, thanks for the heads up about the stuff in RenewEconomy today. I think it will be exceedingly interesting to see whether the AEMC persists with its existing rule, which virtually handcuffs AEMO and Zibelman on demand response, with its burdensome 10 week rule. 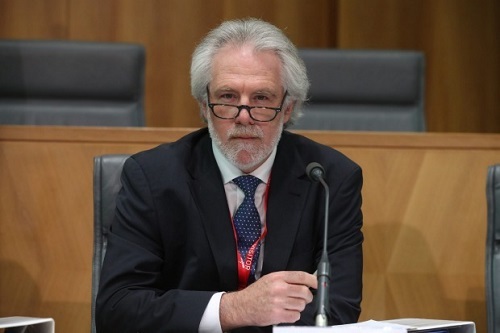 AEMC may make the excuse that AEMO and ARENA have proposed a second trial, so they could sit on the fence until that comes in. AEMO and ARENA said the establishment costs of demand response were one fifth that of a conventional diesel generators – coming in a $200,000 per megawatt of capacity, compared to $1 million/MW for a diesel generator. And because a diesel generator still has to bear the cost of burning that fuel, if used, the gap between the operating costs of demand response and diesel generation were even bigger. That was from the ARENA/AEMO joint response to AEMC Directions Paper Section 5: Wholesale Demand Response. It would be interesting to study what was happening in the companies that were participating in demand response. One would assume that they were operating more efficiently, thus increasing productivity and competitiveness, normally admired by Turnbull’s side of politics. To me the less gas we use the better. John, the likes of ACCC and other ideologues don’t seem to understand that when you privatise you hand the operation over to people whose ruling interest is to make money, and that is what happens when the opportunity presents. Market caps, peak power prices…. If you set up a system that has highly lucrative peak prices, and there’s a technological way to grab big profits, the guys with the technical means will most likely start buzzing around the peaks like eager blowflies. And if anyone takes away the tasty barbecued meat power demand peaks, they’ll be unhappy. As a power user who wants emissions reduced nationally, I thought reduction, smoothing of peaks was one of our aims. You have written about it, John D and others have discussed it here. Rooftop solar output maxima cover a good proportion of home a/c power demand maxima. Just one example. and if that reduces someone’s profit, too bad. While writing the post I knew that there were private aggregators in the demand response area. I’ve found this item about EnerNOC from February 2017. Seems they operate in Texas among others. Texas has a population similar to Australia’s. Somewhere I saw a comment, from Zibelman I think, saying that Texas assembled 3000 MW of demand response. Makes Snowy 2.0 look a bit sick. I’m sure AEMC will be told about what is already happening overseas. It’s a fair bet that whoever was advising Turnbull didn’t know, as he blundered into his pet nation-building project. Thing is he’s already spent billions buying out NSW and Victoria. We had a demand response incident yesterday arvo. I got $10 for cutting my average consumption by 50% for two hours. Had a few hours notice, turned the fridge off. I know AGL used demand response during the last NSW hot day crisis. They did this by turning down the Tomago aluminium smelter which they owned until peak demand had passed. I am not sure how hard/long an aluminium smelters can be turned down before pots start freezing nor just how hard it is to restart a pot if it does freeze. In the mining industry a lot of mines are market restrained rather than production restrained. With a limited amount of warning it is practical to shut down draglines, electric shovels and mineral processing plants. I am sure there are plenty of other industries, offices etc that can reduce power requirements. One of the things that frustrates me is the apparent failure of people to understand that the cost of surplus renewable power is zero. We are moving from a world where the cheapest power will went to users who have very steady power requirements (think aluminium smelters) to a world where the cheapest power will go too users who can tolerate variation in the power supply. We are also going from a world where generators like customers who consume power in the middle of the night into one where there is a lot more power available in the daytime. Time to stop whingeing and accept the adavantages of the new power regime. Ambi: As I have said before the price spike issue has potential market solutions as well as technical ones. The problem with the current spot market is that annual returns for plants designed to fill the extreme peak demand are all over the place because of uncertainty whether the peak will be reached in a particular year and the risk that a competitor will win the bid. Longish term contracts for peaking capacity removes this uncertainty and thus encourages competitive tendering. John D, Tomago Aluminium Company is an independently managed joint venture owned by: Rio Tinto Alcan, 51.55% Gove Aluminium Finance Ltd, 36.05% (owned 70% by CSR Limited and 30% by AMP Limited) Hydro Aluminium, 12.40%. The connection with AGL was that AGL had the contract to supply the power, which is 12% of NSW usage. AGL’s contract contained a clause that allowed them to vary the supply within limits. AGL decided to exercise those limits on a hot Friday afternoon od 10 February 2017 rather than inconvenience the public. The irony is that a failure at Liddell was part of the problem. Two days earlier had seen the lump of coal in parliament sharade. Rooftop solar helped to alleviate the crisis until the sun went down. The idea was to take 300 MW out of the system for four hours by closing three potlines in turn for 75 minutes. I believe to do it he had to have men working on deck where the temperature can be 50C. At the time Hazelwood was still open and Zibelman had not taken up her appointment. It’s fair to say that AEMO at the time was at best reactive, at worst it could be asleep at the wheel. Tomago didn’t line up to help in 2017-18, although I notice that Portland did, where real damage had been done earlier by a local blackout. 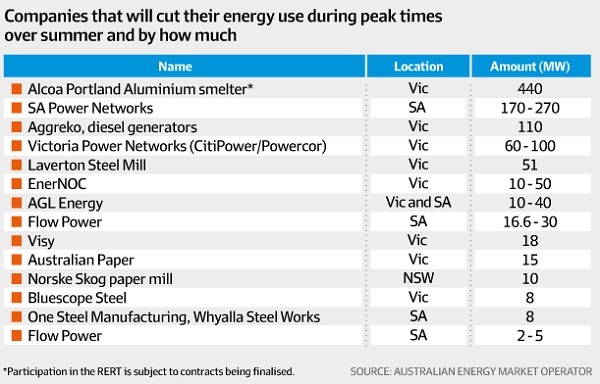 I’ve noticed that Victorian policy seems to be concentrating on strengthening at grid and supply around Portland. The last link above has a lot of graphs and links. One of the things that frustrates me is the apparent failure of people to understand that the cost of surplus renewable power is zero. Almost zero. There’s some ongoing maintenance costs, but they are known and marginal. We are moving from a world where the cheapest power will went to users who have very steady power requirements (think aluminium smelters) to a world where the cheapest power will go too users who can tolerate variation in the power supply. We are also going from a world where generators like customers who consume power in the middle of the night into one where there is a lot more power available in the daytime. Energy storage + interconnectors can & will smooth out the peaks and troughs in supply. It was a shame that only Committee Chair, Paul Green MLC (CDP), Ben Franklin MLC (Nat), John Graham MLC (ALP), and Adam Searle (ALP, Shadow Minister for Industry, Energy and Resources) heard it. Some comments at the later public hearing that I observed on 8 May 2018 suggested to me that some of the Committee members were impressed by Blakers’ testimony. Missing in action were: Deputy Chair, Robert Borsak MLC (Shooters, Fishers & Farmers Party), Jeremy Buckingham MLC (NSW Greens), Taylor Martin MLC (Lib). The only criticism I have with Blakers’ statement above is I think it would be unwise to write-off solar thermal just yet. 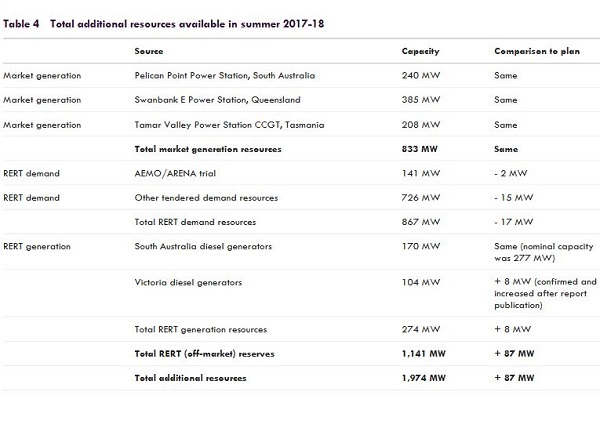 I think the price of energy from new solar thermal generation probably has some scope to fall further – we’ll see – the latest benchmark is the SA Aurora project (at a reported $78/MWh max). Time to stop whingeing and accept the adavantages of the new power regime. I think most people’s world views need an update with a download of the latest information. Perhaps then they can be adequately informed and then reassess the advantages/benefits of the new energy regime.